Wood, being an organic substance, is not as consistent as metal or stone. Wood expands mostly based on the moisture in the environment as opposed to temperature variations. Wood continues to take in and let out airborne moisture long after its been turned into furniture. A tree can be considered a large bundle of very tiny straws pulling moisture up from the ground and into the leafy growth. The Sapwood does most of this while the tree is living but the straw structure in the Heartwood are still intact. A safe assumption is that wood will move 3%-6%. The movement rates depend highly on humidity levels, wood species, and where the board is cut from the log. Wood movement is a general term for the expansion and contraction of a board due to environmental changes, mostly humidity. This movement can exacerbate the internal stresses of the wood causing warping, twisting, and cracking. After a tree is cut down, it is milled into long planks. These planks are often left outdoors to air dry for 1 year per 1 inch of thickness, until the lumber finds an equal moisture with its environment. It is often finished drying in a large kiln or oven to reduce the moisture even further. Dried lumber is more stable and less likely to crack, bend, twist, or bow and is acceptable for furniture. If the lumber is not dried fully, it is considered Green. Green lumber is often used in home building and outdoor structures and is not suitable for furniture (think construction 2x4's). Furniture builders must take this movement into account. Most areas of the country run central heating during the winters. Winters can be a dry season and running the central heating only serves to dry out your home even further. This means that Winter may be the time when your furniture contracts a bit and expands in the humid summers. In the Pacific NW, it is quite the opposite, where the winters are truly humid and rainy, while the summers are often dry. This expansion and contractions can damage poorly constructed furniture over the seasons by causing warping, cracking, or it may loosen joints. A great examples is an outdoor table or picnic table, what once was a flat table top, can turn into a warped and unusable mess. We can also see it in wooden doors, where they may operate smoothly at certain times of the year, but stick other time of the year. Hardwood floors are a common example of expansion and contraction. Certain times of year, hardwood floors may have noticeable gaps in between the boards. This can be an eyesore and and an area that collects dirt and debris. This is why its important when installing new hardwood floors, the floor boards are set inside the room they are to be installed for a minimum of several days. Why its important to customers. Problems of wood movement might not be immediately apparent, it may take several years for the damage to occur. This is unfortunate, because you've essentially bought a piece with a limited lifespan, or one that will need to be fixed. And we all want our furniture to last for decades and keep its value. Ill expand on this topic in the coming weeks. Thanks for reading this longer post. Honestly, there isn't a whole lot to say about splines that can't be gleaned from the left 2 images, but I figure they are worth covering. Splines are thinner pieces of wood set into a cabinet, often on the corners of two adjoining pieces of wood. They are glued into cut grooves and offer extra support to a joint. They provide extra support because they add extra long grain glue surface to an end grain joint. If you've missed my other posts, end grain absorbs glue and leaves a weak and worthless joint on its own. Long grain glue joints are often stronger than the wood, so most joinery is concerned with increasing long grain glue surfaces. Splines area great reinforcement for miter joints. They can be thin or thick. Unlike hidden joinery, splines can be used as an aesthetic element as well. They are often found in contrasting woods to the main cabinet structure. Though using the same wood for splines as the cabinet, provides a nice subtle detail that doesn't scream for attention. Why use an end grain cutting board? The most common example of End Grain is a cutting board or butcher block. Pieces are glued together with the cut end facing up, usually in a checkerboard pattern. End grain is used for a reason! Think about a bundle of straws, but imagine the straws microscopically thin and hard. Now imagine someone splitting logs for a fireplace. We bring the axe down where we can see the rings and the wood splits. This is splitting the straws into bundled sections, its easier to push the straws apart, instead of cutting them into smaller straws. This applies to your knife as well. As you cut through your vegetables on an endgrain cutting board, the thin knife edge finds its way in between the bundled straws and slightly pushes them apart. This is great, because it keeps your knife sharper over time and it also produces much fewer scratches on your beautiful cutting board. A Long Grain or Face Grain cutting board scratches easily. The image on the bottom left is a blown up version of a Face Grain cutting board. The knife comes down across the grain structure of the wood. 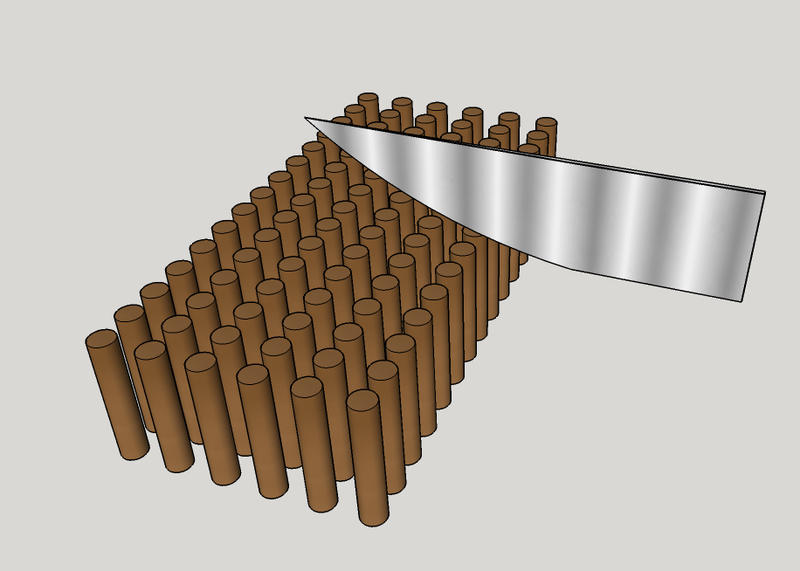 You could cut with the tubes, but ultimately, the structure between the tubes will be separated, and pieces of the board may splinter out. The knives will ultimately scratch and damage the tubular structure and it will dull your knife faster. Long grain cutting boards are usually more attractive and are better suited as serving trays. Just a reminder, keep you wood cutting boards out of the dishwasher. If they are looking dry and worn out, you can coat them in mineral oil or walnut oil. Cover them with as much oil as the board will soak in, then wipe of excess. Do this a few times a year. Olive oil and others may spoil over time and shouldn't be used as a treatment. Edge banding is a thin strip of plastic or wood that is glued on to the sides of plywood to cover up the laminations. It can be used to cover the End Grain of hardwood, but this isn't seen as often and won't be structurally sound as wood expands and contracts. Edge banding can be cut from real wood in the shop or purchased in large rolls with a pre glued back. An iron is then used to press the edge banding onto the wood. The heat from the iron reactivates the glue and affixes it to the wood. True grain continuity is hard to achieve with edge banding. The way the grain runs over from the face of the wood, to the edges or endgrain is consistent in hardwood. The grain won't line up with an edgebanded surface. It also has a tendency to chip and peel off over time, leaving an ugly surface with glue. I always think of library tables from school, the ends chipped. Someone sitting there picking at it, making it worse. Not to be confused with a face frame or frame. A face frame is a thicker piece of hardwood that is affixed to a plywood cabinet face. It adds rigidity to the structure and is much more durable. Ill cover this in a future post. What are miters? Miters are just angled cuts, when put together make a larger angle. The most common example is making a right angle, 90 degrees. It is made of two 45 degree cuts. Why do we use them? We use miters for several reasons. It helps us keep consistent grain or to have a consistent pattern carry around a border, as in the below picture. If we just butted the frame parts together, the pattern would hit an abrupt stop. It also helps us hide the endgrain of wood by concealing it in the joint. It adds beauty and finesse to a piece, that leaves the onlooker guessing just for a moment. Good Miters should be clean and well fitted the length of the joint. They should be paper thin. There should be no opening. Any putty or filler will be visible as a discoloration and is a sign of an poorly cut or clamped joint. When Miters are made on a boards End Grain, an additional support is required for a strong joint. Just gluing End Grain to End Grain makes for weak construction as the End Grain will absorb some of the glue. The protrusions shown in Orange in the image to the left are added tenons, biscuits, or splines to increase the gluing area and add a mechanical element to the joint. Exterior reinforcement can be used to strengthen a Miter as well. Splines are shown on the left in green. Channels are cut into the miter and the splines are then glued in and trimmed off. The result is a much stronger Miter with an added decorative element. The splines can be of a contrasting material or of the same material for a more subtle element. What is a mortise and tenon? A mortise and tenon is a trusted and commonly used furniture joint. Its used most often in a table or bed frame, where weight makes structure vital. The mortise is a rectangular or oval hole, that is cut out of the leg. The tenon is the shaped end of another piece of wood that fits into the mortised hole. The mortise is usually placed in the leg and is cut into the face grain. The tenon is made by trimming the end of the apron or runner to fit snugly in the mortise. This joint is often considered a sign of a higher quality table or bed. A well constructed mortise and tenon increases the stability of the furniture and when well executed and glued, the pieces are considered inseparable. It prevents table legs from racking and shifting over time, there are no bolts that can become loose, and will last as long as the wood has not rotted or become compromised. It is not intended to be disassembled so does not work well with knock down or flat pack furniture. A simple and effective alternative to the Mortise and Tenon is the Floating Tenon. The mortise is cut into both of the components that are to be joined. Then an additional pieces is cut and glued into both mortises. While arguably not as strong as the mortise and tenon, it is very close in strength and will work for nearly all the same applications as the traditional. Both the Floating Tenon and regular Mortise and Tenon can be reinforced mechanically. This would be accomplished by drilling holes through the leg and tenon while the tenon is inside. Then a wood or metal dowel is driven through both while assembled. This type of joint is not going anywhere. Face Grain is probably what most of us think of when we talk about wood grain. This is the patterned, dark and light lines we see when looking at wood. We see it every day in wood floors and table top surfaces. When looking at a typical hardwood floor, or even fake wood floor, we are seeing the face grain. The different colored striations are actually the growth rings of the tree, just seen from the side. The darker stripes are often smaller, and develop when the tree is in the Fall and Winter months. The lighter stripes are generally larger and reflect the better growing period of the Spring and Summer months. The pattern of this grain reflects the way the wood was cut into lumber, but we can get into that another day. End Grain is when you are actually looking at the growth rings of a tree, such as a stump, when you are able to count the seasons that tree has lived. End grain is like the top of a bundle of straws. It is the most porous part of the wood and absorbs the most moisture. Hey! this is why we see the ends of boards painted in the big lumber stores. They paint them with a latex paint, to slow the amount of moisture absorbed while waiting to be purchased. The endgrain will also absorb more of the protective finish that is applied. This will lead to the endgrain having a darker color than the face grain. End Grain doesn't have much in the way of pattern and is sometimes hidden because of this. Generally,you will not find endgrain on plywood furniture. The edgebanding that is used to cover the sides of plywood is mostly manufactured in face grain, though there are endgrain options as well. The most common household example of End Grain is a cutting board or butcher block. End grain is used for a reason! Think about the bundle of straws analogy, but imagine the straws microscopically thin and hard. Now imagine someone splitting logs for a fireplace. We bring the axe down where we can see the rings and the wood splits. This is splitting the straws into bundled sections, its easier to push the straws apart, instead of cutting them into smaller straws. This applies to your knife as well. As you cut through your vegetables on an endgrain cutting board, the thin knife edge finds its way in between the bundled straws and slightly pushes them apart. Looking for pattern continuity from the face grain to the end grain is one of the easiest methods to tell if you are looking at edgebanded plywood or a true hardwood top. A quick thank you to What Designers for featuring Imago Furniture on their site. This is a great site to find new, modern designers. Fashion, Art, Furniture, Illustration. They got it, go there. I have a place in my heart for hardwood, especially walnut. But there are so many materials used in furniture, Id like to cover as many as possible over the course of this journal. Plywood, MDF, Particle Board, and OSB are all sheet goods that are often substituted or used along with hardwood in furniture. They can have their place, but are often used as cheap substitutes and to reduce manufacturing time and cost, but this is not always the case. OSB stands for Oriented Strand Board. Really not used often in building furniture, but below is a great example that prompted me to start with this overlooked material. Jory Brigham, out of California used it superbly, laminated together to make the Chumash . The texture will definitely show through when painted. Its also held together with glues and possibly formaldehyde, though this is becoming less common. Its most often used in construction and as an easy, textured substitute for drywall in shops. Seen in Parks and Rec behind Ron and Johnny Karate!